The Pump Protector™ air pump cover and base is a small investment that will extend the life of your air pump by protecting it from the elements as well as soften the noise. The Pump Protector™ will house nearly any linear air pump, rotary vane compressor, or 1/3 and 1/2 HP regenerative blowers. There is also enough room to cover your electrical boxes or system control panel! 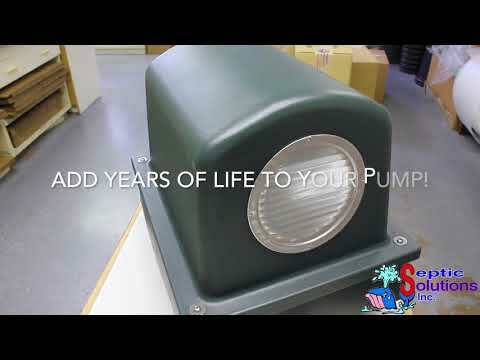 The Pump Protector is manufactured exclusively for Septic Solutions from high quality injection molded plastic. The two piece setup includes a 5’’ tall hollow base that keeps your aerator pump up off of the ground and a vented housing cover that attaches to the base via (4) stainless steel bolts. The Pump Protector features curved edges and a rounded top which give it superior strength. The 8’’ aluminum vents on each end of the housing and the ventilation gap between the housing and the base provide more than ample air circulation which can add years to life to your air pump. The matte green finish blends in with your lawn or landscaping and will not fade or deteriorate with years of exposure to sunlight and weather.